The annual Take a Kid Fishing (TAKF) at the Groynes in Christchurch very likely continues to host the largest concentration of young anglers in New Zealand. Originating from the forward thinking of David Denton decades ago, this event has become so successful that the numbers have had to be restricted to a maximum of 6000 young anglers; many accompanied by their parents. “The support of volunteers, some 60 angling club members, and North Canterbury Fish and Game has seen the event blossom and it is now run by the Take a Kid Fishing Charitable Trust,” says David Denton. Thanks to the Isaac Conservation and Wildlife Trust, a release of 800 rainbow trout of around 1-2kg was made immediately prior to the event. Twenty-one rogue hatchery rainbows – all double-figure fish – were also released. Alana Beeney age eight, of Rangiora, was most delighted with the nine-pound rainbow she caught. 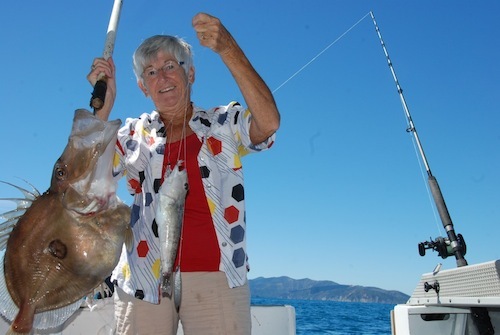 “The fish was almost as long as she is tall,” said Fish and Game South Island Communications Advisor Richard Cosgrove. The combined effort by Christchurch City Council and Ecan saw the Groynes ponds in perfect fishing condition after they procured a weed cutting machine from Rotorua that removed some 40 tonnes of vegetation from the water. “That effort was strongly applauded and made today possible,” said Cosgrove.